Vitamin D helps prevent colds and the flu, promotes calcium absorption and much more! Sunshine. For years, dermatologists have cautioned us about getting too much of it. Frightened by their repeated warnings that too much sun puts us at risk for skin cancer, we avoid the sun altogether or smother our bodies in sunscreen before heading outdoors. We assure ourselves that we are protecting our health, but what few of us realize is that we are depriving our bodies of Vitamin D, an essential nutrient our immune system relies on to protect us from a whole host of chronic and infectious diseases. Vitamin D is produced when our skin is exposed to the UVB rays of the sun. Thus, when we avoid the sun, we are blocking the production of Vitamin D and the healing effect it has on our bodies. It has long been known that Vitamin D helps our bodies absorb calcium, which is crucial to the health of our bones and teeth and for the prevention of diseases like osteoporosis and rickets. However, a growing body of research now points to the critical role Vitamin D plays in reducing the risk of different types of cancer, including breast, prostate and colon cancer; diabetes; coronary heart disease; congestive heart failure; multiple sclerosis; and tuberculosis, to name a few. But, despite scientific evidence of Vitamin D's influence on our overall health, most of us don't maintain a sufficient level of Vitamin D in our bodies to reap its benefits. Sensible, moderate exposure to natural sunlight is still the simplest strategy for producing Vitamin D in our bodies. However, since we are no longer a culture of hunter-gatherers who spend our days outdoors, the amount of Vitamin D we get from the sun is woefully inadequate. The good news is that we can achieve the same health benefits by taking this powerful nutrient as a supplement - only in much larger doses than the daily intake of 400 IU that is currently recommended. 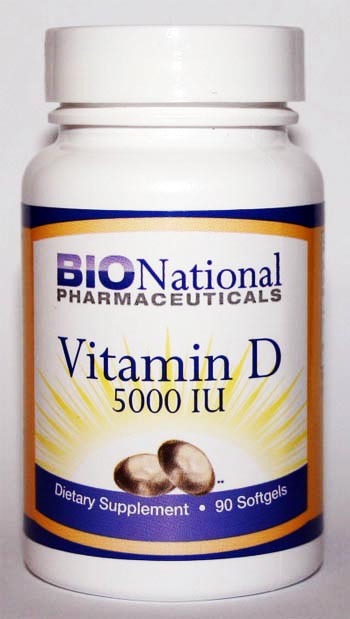 Based on recent studies examining the role Vitamin D plays in maintaining healthy tissue throughout our bodies, researchers are now recommending daily doses of between 3,000-to-5,000 IU and more. Therefore, it is no surprise that researchers studying the role Vitamin D plays in preventing cancer found a higher incidence of the disease in people with low levels of Vitamin D in their bodies. Participants in the study included dentists, optometrists, osteopaths, podiatrists, pharmacists and veterinarians between the ages of 40 and 75 who spent most of their time indoors, limiting their exposure to sunlight. Using factors such as geographic region, dietary intake of Vitamin D (including supplements), skin pigmentation, body mass index (BMI) and leisure-time physical activity, researchers were able to predict an average level of 25-hydroxy-vitamin D (25 OH D) - the major blood-circulating form of Vitamin D - for each participant and examine any relationship it may have to their risk for cancer. The association between low levels of Vitamin D in the study, which was conducted over a 14-year period between 1986 and 2000, revealed that increased levels of 25 hydroxy-vitamin D (25 OHD) - the major circulating form of Vitamin D that can be detected in the blood - is associated with a lower incidence of all types of cancer - especially digestive system cancers - as well as deaths from those cancers. The researchers found that increases of 10 ng/ml (nanograms per milliliter) of 25 OHD in the blood (the equivalent of about 1,500 IU of Vitamin D daily) were associated with a 17 percent reduction in cancer rates; a 29 percent decrease in cancer deaths; a 43 percent drop in digestive system cancers and a decline of 45 percent in digestive-system cancer deaths. They concluded, therefore, that Vitamin D deficiency may be responsible for an increased rate of cancer and death in men - particularly for cancers of the digestive system. In a recent study of Japanese schoolchildren, researchers from the Jikei University School of Medicine in Tokyo found that children who took Vitamin D were three times LESS likely to suffer from flu than children who were not supplemented with Vitamin D.7 During the study, 354 children, ages 6-to-15, took 1200 IU of Vitamin D or an inactive placebo for three months during the 2008-2009 cold and flu season. Only one in 10 of the children taking Vitamin D came down with the flu compared with one in five taking the placebo. Evidence is mounting that Vitamin D deficiency may put us at increased risk for cardiovascular disease, according to an article published in Circulation: Journal of the American Heart Association, in 2008. In that article, Framingham Heart Study researchers report a striking correlation between low levels of 25 OHD in the blood and increased risk of cardiovascular disease, above and beyond established risk factors.10 The higher risk was particularly evident among those with high blood pressure. During the study, which included 1,739 white men with an average age of 59, researchers found that those with 25 OHD levels below 15 ng/ml had twice the risk of a cardiovascular event, such as a heart attack, heart failure or stroke in the next five years compared to those with higher levels. While the effects of disease take an incredible toll on our lives and those of our families, the treatment of these diseases also contribute to a significant portion of our country's health care costs. By increasing our levels of 25 OHD to an average of 40 ng/ml - which is the equivalent of between 2,000-to-3,000 IU of Vitamin D daily - we could reduce the overall economic burden of these diseases by nearly 18 percent or about $199 billion, according to a recent study by SUNARC.13 By raising our 25 OHD levels to 60 ng/ml, the benefits for our health and our health care system would increase proportionately, the study suggests. The skin produces about 10,000 IU of Vitamin D in response to 20-to-30 minutes of midday sun exposure, according to the Vitamin D Council. However, there are a number of circumstances that can reduce the amount of Vitamin D we get from the sun. Dark-skinned people may need 20-to-30 times as much exposure to sunlight as fair-skinned people to generate the same amount of Vitamin D. Obesity also impairs the body's ability to utilize Vitamin D, meaning that obese people need twice as much to experience its benefits. The further north we live, the less Vitamin D we get from the sun during the cold winter months. And, as we age, our body's ability to produce Vitamin D from sunlight diminishes. After sticking with a regimen of 5,000 IU daily for two-to-three months, the Vitamin D Council recommends that we obtain a 25 OHD test. After learning how much Vitamin D we have in our blood, we can adjust our dosage so that we maintain between 50-to-80 ng/ml of this important nutrient year round. 2. Prospective Study of Predictors of Vitamin D Status and Cancer Incidence and Mortality in Men. Giovannucci E, Liu Y, Rimm EB, Hollis BW, Fuchs CS, Stampfer MJ, Willett WC. Journal of National Cancer Institute 2006; 98: 451-9. 3. Cancer Causes Control 2000; 11(9): 847-852. 6. Vitamin D Council. Vitamin D in Cancer Prevention and Treatment. www.vitamindcouncil.org/cancerTreatment.shtml. 7. Randomized Trial of Vitamin D Supplementation to Prevent Seasonal Influenza A in School Children. Mitsuyoshi U, Takaaki S, Minoru O, Mana K, Yasuyuki W, Hiroyuki I.
American Journal of Clinical Nutrition, May 2010; 91: 1255 - 1260. 8. Ultraviolet B (UVB) Radiation and Vitamin D are Important Risk Reduction Factors for Multiple Sclerosis. Grant WB. SUNARC. www.sunarc.org. 10. Epidemiology: Vitamin D Deficiency and Risk of Cardiovascular Disease. Wang T, Pencina MJ, Booth SL, Jacques PF, Ingelsson E, Lanier K, Benjamin EJ, D’Agostino RB, Wolf M, Vasan RS. Circulation. 2008; 117:503-511. American Heart Association. 12. Intake of vitamin D and Risk of Type 1 Diabetes: A Birth-Cohort Study. Hypponen E, Laara E, Reunanen A, Jarvelin M, Virtanen S. The Lancet. 2001; Volume 358; Number 9292: 1500-1503. 13. Estimated Benefit of Increased Vitamin D Status in Reducing the Economic Burden of Disease in Western Europe. 2009. Grant, WB, Cross HS, Garland CF, Gorham ED, Moan J, Peterlik M, Porojnicu A, Reichrath J, Zittermann A. SUNARC www.sunarc.org. and reducing the Burden of Disease Through Adequate Intake of Vitamin D3. A Presentation at University of California, San Diego. April 9, 2008. Grant WB. SUNARC www.sunarc.org. 14. How to Get Enough Vitamin D. Vitamin D Council. 16. Paul Knekt, Annamari Kilkkinen, Harri Rissanen, Jukka Marniemi, Katri Saaksjarvi, Markku Heliovaara. Serum Vitamin D and the Risk of Parkinson Disease. Arch Neurol Jul 2010; 67: 808-811. 17. Broe, K. E., Chen, T. C., Weinberg, J., Bischoff-Ferrari, H. A., Holick, M. F. and Kiel, D. P. (2007), A Higher Dose of Vitamin D Reduces the Risk of Falls in Nursing Home Residents: A Randomized, Multiple-Dose Study. Journal of the American Geriatrics Society, 55: 234-239. 18. Bischoff-Ferrari HA, Willett WC, Wong JB, Giovannucci E, Dietrich T, Dawson-Hughes B. Fracture prevention with vitamin D supplementation: a meta-analysis of randomized controlled trials. JAMA. 2005 May 11;293(18):2257-64.